What to eat to ensure that you’re getting all of the nutrients your body needs to avoid dangerous and potentially life-threatening deficiencies. Which healthy foods prevent you from absorbing the nutrients your body needs, and simple tweaks to combat this issue and prevent deficiencies. Get a Discount on Tickets! On May 19-20th, I’ll be joining one-dozen leading nutritional and fitness experts including Dr. Joel Kahn, Dr. Michael Klaper, Dr. Brooke Goldner, Will Tucker, and Ocean Robbins at an incredible event in Costa Mesa, California. The live and life-changing, two-day event will help you convene with like-minded people from around the country, get answers to your burning questions, and realize your healthiest dreams. You’ll get to meet and hear from world-renowned physicians and others who’ll share secrets to preventing and reversing disease, lasting and rapid weight-loss, and non-stop energy. 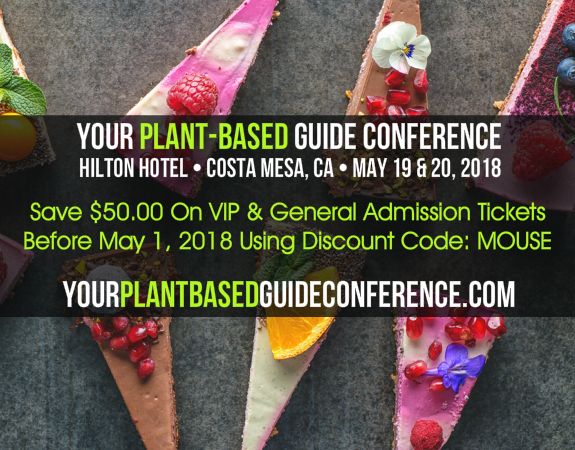 Click here to find out all about it and use the following discount code to save $50.00 on VIP and General Admission tickets: MOUSE Hurry, because this $50.00 savings ends April 30, 2018 at 11:59 p.m. PST! P.S. Whether you’re interested in losing weight, building muscle with plants, or reclaiming your good health and energy, this conference will give you real solutions, from experts you can trust. Find out more here to sign up now!